"Tender beef brisket in a flavorful guajillo sauce with Mexican seasonings. This is the quick pressure cooker version of the traditional recipe from Guadalajara, where the meat is slowly cooked in an underground oven. [Recipe originally submitted to Allrecipes.com.mx]"
Place brisket in a stovetop pressure cooker. Add onion, garlic, bay leaves, and salt; cover with water. Close cooker securely and place pressure regulator over vent according to manufacturer's instructions. Heat until steam escapes in a steady flow and makes a whistling sound, about 10 minutes. Adjust temperature until regulator is gently rocking. Cook for 60 minutes. Let pressure release naturally according to manufacturer's instructions, 5 to 10 minutes. Unlock lid and remove. 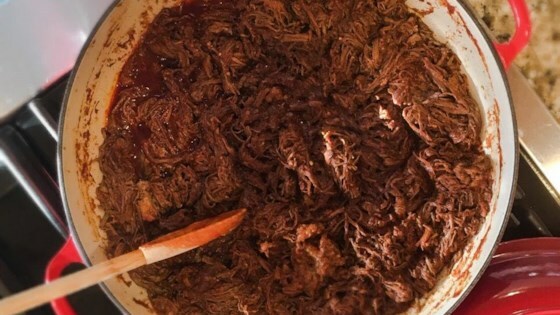 Remove brisket from the pressure cooker and shred with 2 forks. Strain the cooking liquid, discarding solids. Measure 2 cups for the barbacoa sauce and save the rest for another use. Combine guajillo chile peppers and ancho chile peppers in a saucepan. Cover with water, bring to a boil, and cook for 5 minutes. Remove from heat and let stand in the hot water until softened, about 5 minutes. Drain. Combine softened chile peppers, vinegar, garlic, cloves, allspice, black pepper, oregano, thyme, cumin, ginger, cinnamon and reserved 2 cups cooking liquid; blend until thick and very smooth. Pour sauce into a heavy-bottomed pot over medium heat and season with salt. Bring to a soft boil; reduce the heat to low. Stir in shredded beef, coating completely with sauce. Cover pot and cook until flavors combine, at least 30 minutes and up to 1 hour. Nutrition data for this recipe includes the full amount of barbacoa sauce. The actual amount of sauce consumed will vary.